I have just returned from a 10 day trip to visit one of my daughters doing a semester abroad. I was lucky enough to travel with my husband and meet my three other children, plus a son-in-law over there. What a great group we had! And we were so blessed. Thousands of travel details, transportation and hotels, and about a dozen or so business meetings to arrange – and everything went perfectly. Now when I say perfectly, I mean we managed to get ourselves from country to country, meeting to meeting, hotel to hotel enjoying ourselves, being cognizant of living in the moment and trying to laugh at the snafus even while living through them. And we enjoyed every minute of it! Even the occasional personality clashes and scratches and dents to the day, the arrangements and the car! The longer I live the more I value one personality trait above all else. A SENSE OF HUMOR. How else can you get through navigating a “mini” van the size of a hotel courtesy shuttle through the narrow ancient streets of medieval old towns and being turned away from parking lot after underground parking lot because your 9 passenger vehicle is too tall? Or laughing when a stereotypical French man joined in (for no good reason) to an unfortunate situation at a closing restaurant (lunch is ONLY served until 1:30) who shouted FINGER in heavily accented English at us, (think – FYNN-GAAR) probably thinking it was an American curse. So I count my blessings, one at a time, starting with my gratitude for the gift of laughter. What great senses of humor my family has. And how wonderful it is that they employ this as a weapon to keep their perspective on the tribulations of life! 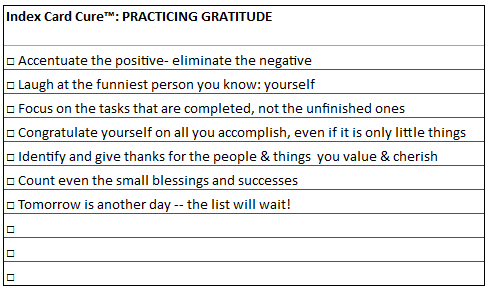 Continuing the thought articulated in our blog on SELF CARE, I have found a practical way of practicing gratitude and focusing on the positive in my life, rather than the lists of unfinished tasks and the myriad of things that go awry each day. At night before I go to sleep, I count my blessings instead of sheep (actually the chorus of an old Bing Crosby song!) I am a fretter – everyone knows it. I have spent sleepless years mulling over my failures of the day until one of my friends helped me flip my perspective. We were chatting on the phone, while I tried to cook dinner (too much multitasking) and she said, “I got so much accomplished today!” This gave me pause. WOW! I never felt like that. In fact I am sure I had never uttered those words. “Gee, that is great!” I said. “What did you do?” “I cleaned a bathroom, did 2 loads of laundry, read all of the kids’ papers from school (remember when teachers sent notes and flyers and not emails? With 4 kids, one year actually in 4 different schools, the amount of paper that came home was phenomenal. And then you had to read it, and respond!) went grocery shopping and made dinner.” And a light went off in my head. I had done all that too — and more! I refereed a fight between the two oldest and got them to see eye to eye, took one kid in for a check up and still had energy to let them “help” me make cookies for dessert! Instead of focusing on the 6 more things I really felt I should have done, why not review all the things I checked off the list and feel proud of my accomplishments? What did I think, that if I allowed my self to acknowledge all I had done, tomorrow I might get a swelled head and slack off? So now at the end of every day, I force myself to feel proud of what I have accomplished, and ignore my teeth gnashing about what is still on the list. Maybe the task was only meant to be finished tomorrow anyway!